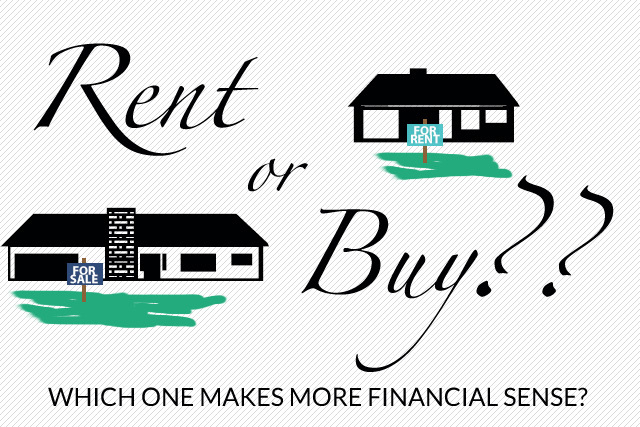 Owning a home has long been a big part of the American Dream, why rent when you can buy? After all, if you’re renting you’re basically throwing your money down the drain, right? Well, we know that is not always the case but the desire to own a home is understandably still a common sentiment and goal. While renting is great in certain situations such as you are unsure of where you want to settle down, there are still significant financial advantages to owning a home. Take a look at the info below to get a better picture of the renting v. owning debate. Tax breaks – Homeowners get substantial tax credits including interest deductions and some reduction in principle, which can help offset the cost of owning a home. You build equity – Your monthly payments are going towards building equity in your own home rather than someone else’s. Fixed monthly payments – If you lock in a 30 year mortgage, your monthly payments won’t change unless you refinance. Comparatively, your rent could increase as much as 5-10% a year. Freedom to do what you like with your home. You won’t have a landlord restricting your ability to decorate, landscape, or make changes. With that said, I have talked to some clients who feel that they’re better off renting even if they can afford to buy. So is renting a waste of money? No, you are paying for a roof over your head and a place to live, so that’s hardly a complete waste. But, on the other hand, the average condo in Los Altos, Palo Alto, Mountain View or Menlo Park rents for between $3000 and $5000. So let’s take a look at the numbers so you can see just how much you spend on rent, assuming that your rent increases an average of 5% a year and you stay in the same home for 10 years. One thing I’ve noticed is that many people tend to think of their rent in the monthly sense rather than an annual cost. When you look at the total you spent annually on rent, it feels a little different! And none of that $460,121 is returned to you – it builds equity for someone else. Ideally, you’d like your monthly payments to “come back to you” through building equity in your own home. I find that one of the most common reasons people want to hold off on buying is they want to feel out the market, see if prices drop, and figure out which neighborhood is best for them. Often times these people plan on renting for a year while they check things out. As you can see above, the cost of renting a home for a year is substantial and waiting things out can often hurt you, especially in a market like ours where prices are on the rise. Interest rates are at an all time low – But it’s also important to keep in mind that they change daily. Just because they’re below 4% right now doesn’t mean they will be a year from now. Our housing inventory is low – That means when a home comes on the market we’re seeing lots of multiple offers and bidding wars, which sends prices up. It’s a simple matter of supply and demand, more people want to live here than we have houses, so when a new place comes on the market, it’s snatched up. Prices are on the move – Right now we’re looking at an average annual gain of about 5-10%, which means that a house that is $1,000,000 today might be $50,000 – $100,000 more one year from now. Rent in the Silicon Valley is high – If you want to rent a home in Los Altos, Palo Alto, Mountain View or Menlo Park you will typically be looking at a monthly rent of around $5,000-$8,000/month, for a total of $60,000 – $96,000 per year. Add that to the $50,000 – $100,000 in rising home prices and the total cost for renting for one year while you shop around could be $110,000 – $196,000. SO WHEN IS RENTING A GOOD OPTION? You’re unsure about whether you want to stay in the area for more than a few years or you are relocating to the area temporarily. You don’t want to be tied down and enjoy the freedom of being able to be “mobile” – you can quit your job and move or do something else without being held back by your mortgage. You’re unsure about your employment. You can’t afford to buy at the moment. You don’t have the money for a down payment – while there are programs where you need less than 20% for a down payment, in all likelihood, in this area you’ll still need to put a substantial amount of money down. You don’t want the responsibility of owning a home. Though if this is the case, a condo might also be a good option for you. Overall, buying a home is a smart investment, especially in an area like the Silicon Valley but what it comes down to is lifestyle preferences and finances. Let me help you figure out if buying a home is the right decision for you and I’ll be there to guide you through the process and figure out which neighborhoods would be a perfect fit for you! If you’d like to do some research on your own, check out this interactive calculator from nytimes.com or a comparison chart.